The Working Paper (in Italian) provides a snapshot of the allocation of the Municipal Solidarity Fund (MSF) in 2017 on the basis of the official figures recently published by the Ministry of the Interior. For the third year in a row, transfers to municipalities will be partly determined on the basis of the new equalisation criteria based on standard funding requirements and the estimated fiscal capacity of each local authority. The PBO analysis also examines the possible redistributive effects of the system when, in 2021, the legislation is will take full effect and the equalisation mechanism will be applied to a greater extent than is currently the case. The innovations introduced in 2017 reduced the impact of the historical component, gave greater weight to the equalisation of basic functions over non-core functions and revised the methods for calculating needs and fiscal capacities. These changes involve relatively small effects compared with the 2016 distribution. From the dimensional point of view, for municipalities with up to 150 thousand inhabitants the revision of the methodology in 2017 strengthens the 2016 distributive impact, while for large cities it mitigates it. Overall, compared with the historical distribution, in 2017 the greatest penalty is borne by the smallest municipalities (losses of more than 2 per cent of historical resources), while large cities (+1.1 per cent) and municipalities with 5 to 50 thousand inhabitants benefit the most. From a geographical point of view, the allocation of the fund for 2017 confirms a reduction in resources compared with historical levels for northern municipalities (-0.9 per cent of past resources), worsening the position of municipalities in the north-west slightly and improving that of municipalities in the north-east. The greatest benefits are concentrated in the Centre (+2.1 per cent), with the 2017 revision increasing resources. 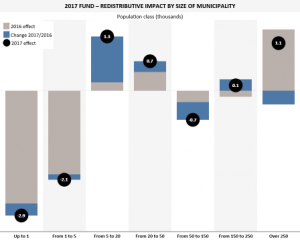 Also benefiting, although to a lesser extent, are municipalities in the South (+0.5 per cent compared with past levels), with the 2017 revision having a very limited impact. Among the major cities the new system provides the greatest benefits to Rome (+6.7 per cent compared with historical levels, with an increase compared with the situation in 2016). 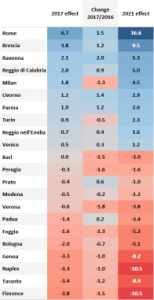 Milan also receives more transfers than its historical baseline, although the revision of methods and parameters for 2017 reduces the overall benefit. 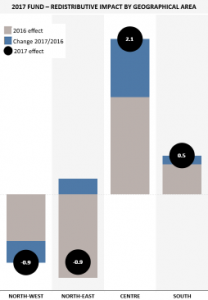 Florence, Taranto, Naples and Genoa experience a reduction of more than 3 per cent of resources, and are generally penalized in the transition to 2017. The larger cities that benefit most from the changes introduced with the 2017 Fund are Ravenna (+2 per cent compared with 2016) and Rome (+1.5 per cent), while the most penalized are Verona (-1.8 per cent) and Perugia (-1.6 per cent). The projection of the fund to 2021, the year in which the weight of the equalisation component linked to standard requirements will rise to 40 per cent, shows an overall amplification of the distributive effects: among the major cities, Rome would benefit from the largest increase in transfers, equal to 16.5 per cent of historical resources, while the largest penalty would be borne by Florence and Naples (-10.5 per cent of past resources). Overall, about 90 per cent of authorities would experience variations in resources of between -15 and +15 per cent of historical resources. Overall, the analysis in the paper reveals, apart from specific cases, the broad financial sustainability of the effects of the system for determining transfers, which, however, is characterized by a degree of inertia with respect to the historical allocation of resources and does not remedy the large regional disparities in service delivery. This dilutes the potential impact of the innovative features introduced in municipal equalisation and may appear to deviate from the expectations existing before the standard requirements were determined. However, this is probably the inevitable result of the condition of invariance of total resources for municipalities imposed with the transition to the new equalisation system and of the contraction in the financial flexibility of local authorities due to the fiscal retrenchment of recent years, measures that have had an especially large impact on resources for equalisation. The strengthening of equalisation would involving linking the allocation of financial resources and the setting of minimum service levels and intermediate service objectives for all local authorities throughout the country, in order to eliminate the divergences in service delivery levels that still characterize the situation as it now stands. It should be noted, however, that the wealth of information collected for the determination of standard requirements and fiscal capacities and knowledge acquired on standardization approaches gives national legislators and local administrators the cognitive tools to compare efficiency between individual local authorities and for the possible future strengthening of equalisation in the system for financing local government.